What strikes a visitor to the Riviera Maya, is an exuberance of light and colors, among the most beautiful beaches anywhere. Tulum is well known to the tourists flocking to the Riviera Maya year round. The Caribbean coast of the Yucatán peninsula, offers sun and fine sand beaches, together with superb hotels large and small, and the great Mexican hospitality. Along the coast and not far inland, are remains of Maya cities and towns, witnesses to a dynamic culture spanning thousands of generations. 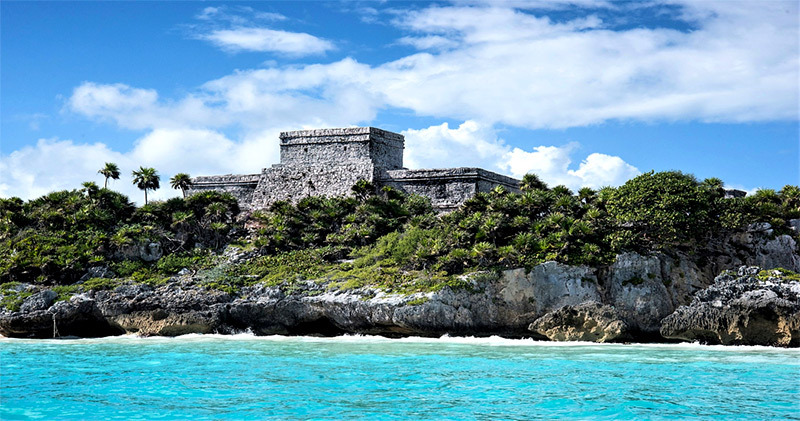 We will focus here on Tulum in the State of Quintana Roo, on the peninsula’s west coast, known in pre-Columbian times as Ekab. The city’s Maya name, Zamá, translate in Maya-Yucatec as “dawn”, because the city was built on the seashore facing East, where the sun rises. 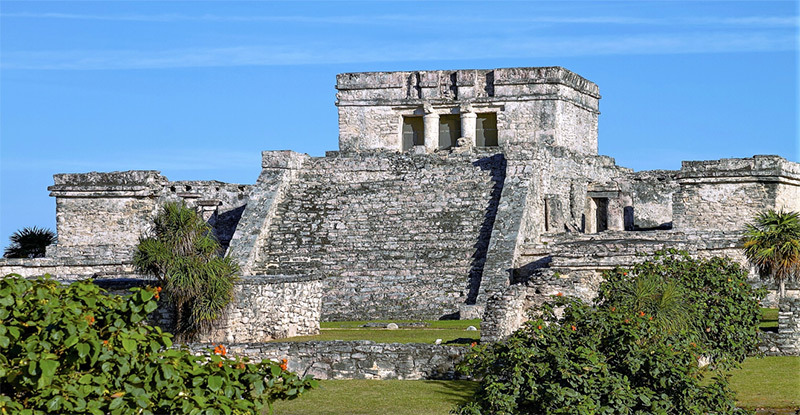 Tulum was then known in the Maya language as Zamá; it was a major stake holder as a trading center within and around the Yucatán. 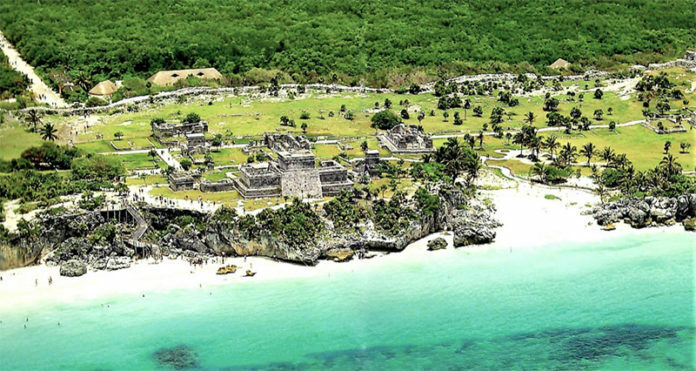 The sea, rivers and overland trade routes, and alliances with inland chiefdoms and cities, are essential to understand Tulum’s regional importance during the Early to Late Post Classic period – 1250-1550AD. Tulum translates as “wall” because it is enclosed by walls on three sides, while the fourth side, East, is open to the seashore. On the eastern side, the main seaward defense are the 12ft/3.5m high rocky cliffs. The Castillo is the elevated structure below, in the middle of the promontory. People living outside the city walls took refuge inside when warned of assault by raiders. The city’s Maya name, Zamá, translate in Maya-Yucatec as “dawn”, because the city was built on the seashore facing East, where the sun rises. It was the head of a batabil or independent chiefdom, part of a regional settlement together with Tankah-Xamanzamá and Xhelhá. The heart of the city (below) is where secular-religious leaders conducted extensive political and trade negotiations, extending inland on the peninsula and beyond. Maya traders, the p’oloms, extensive long distance trade reached the Bahia de Amatique in Guatemala, and further South to today’s Belize, the Gulf of Honduras and the Bay Islands. 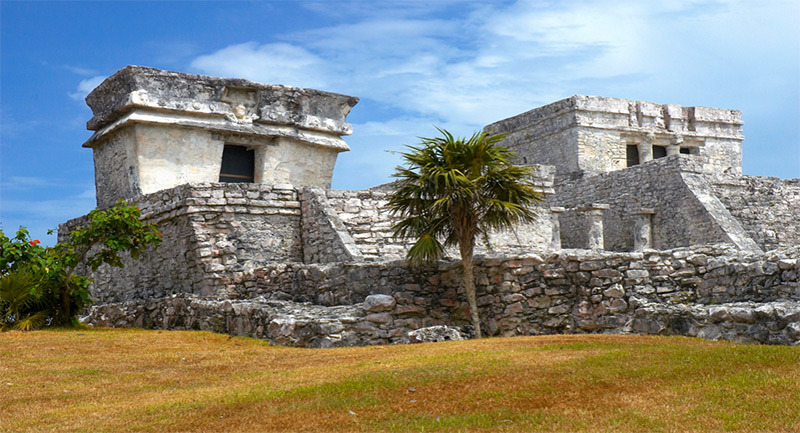 Trade with inland cities, such as Chichen Itzá in central Yucatán and the Central Plateau of Mexico, was thriving. 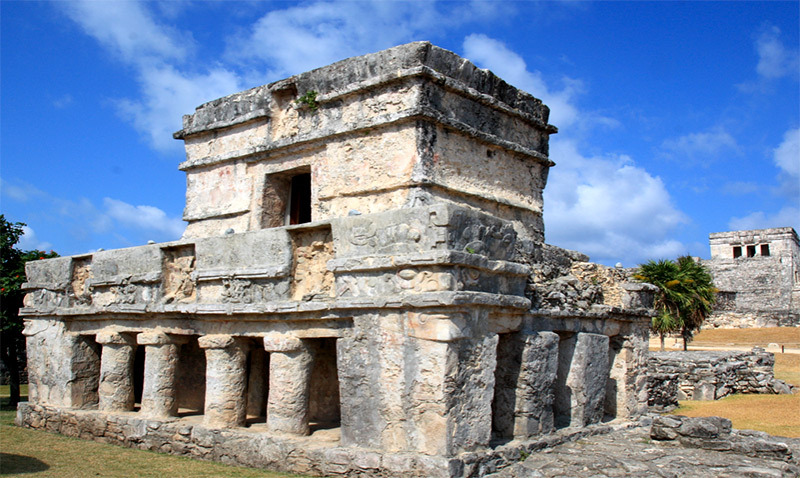 Tulum historic timeline spreads over 275 years, from the early to the late Post Classic. The heart of the city (above), is referred to as the Inner Precinct, with El Castillo (center), the Temple of the Descending God (far left), and the Temple of the Initial Series (far right). El Castillo is the main structure in the Inner Precinct, the most exclusive and restricted area of the city, enclosed by a non-defensive wall, with three access gates. The buildings were made for religious purposes, as well as for high ranking leader’s living areas. Three other types of structures seen above are: small temples, shrines and stepped platforms. From the later are remains of foundations of perishable structures, mostly used for ceremonial events. One of the two steps platform (Str.13), may have been a small temple, since two graves were found below its floor, at its center. 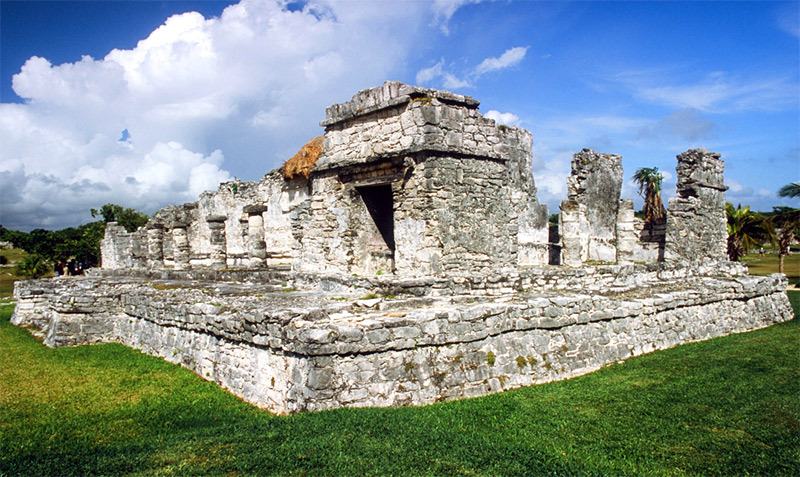 The Temple of the Descending God – Templo del Dios Descendente (Str.5), is located within the Inner Precinct. Over the doorway is a niche with a stucco figure representing the Descending aka Diving God, identified as God.E, the maize god Hun’Nal’ Ye the “First Father of Creation”. The god is shown with his feet up, in a diving stance, unique in the pantheon of Maya deities. Similar figures of the Descending God, are found throughout the city, carved on plaster or stone on buildings, and painted on ceramics. 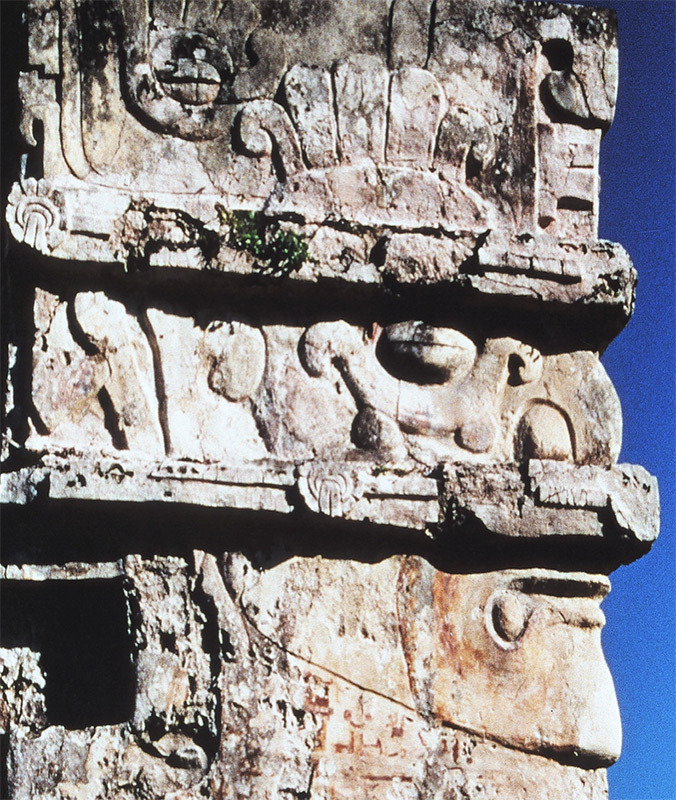 The Descending God is found in other Yucatán sites, notably atop the Nohoch Mul pyramid at Cobá, at Tankah and Sayil. God.E is the Maya counterpart of Centeotl of Central Mexico. 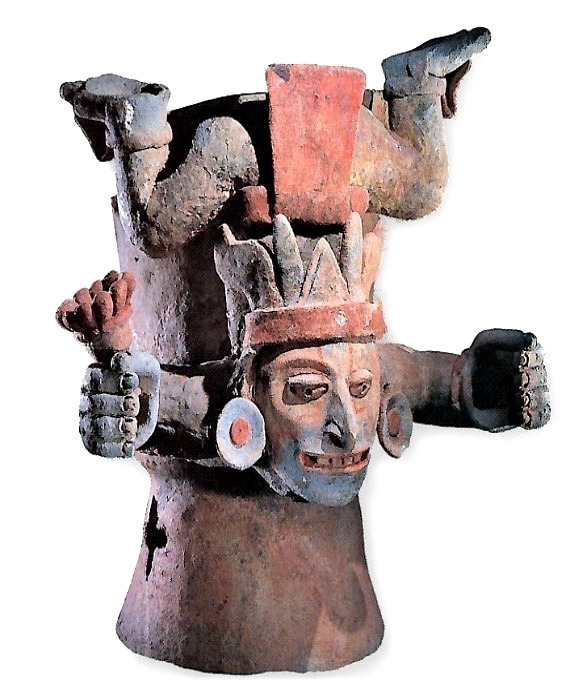 The concept of a god descending from the sky is a common belief and symbol in Mesoamerica. Its Aztec equivalent may have been Tzontemoc, God of the Setting Sun. 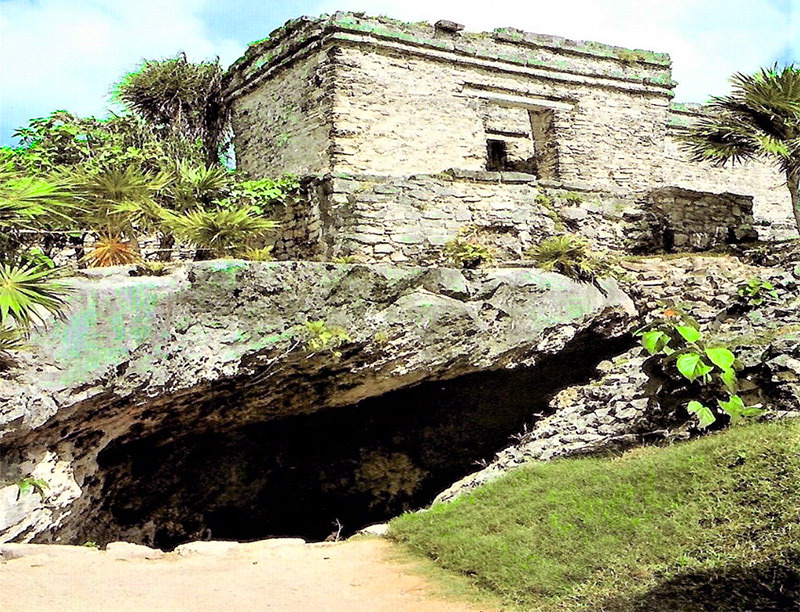 Located close to the northeast door of the city is the Casa del Cenote (Str.35). Cenote means sink hole in Spanish, and d’zonot in Maya. They are found in ancient locations and in today’s towns and villages. They are an important water supply in a region practically devoid of surface rivers. Under the floor of the shrine inside the building, is a tomb that contained remains of several individuals, possibly those of the nobility given that the structure was built directly over the cenote, the road to Xibalba, Maya-Ki’chè for “place of fright”, the underworld. Stairs allowed to reach the water table about 15ft/4m under ground level. The Temple of the Frescos – Templo de las Pinturas (Str.16), is the best preserved structure and of major interest in the ancient city for its iconography. It is located outside of the Inner Precinct, and about in the middle of the city. Dated Late post-Classic (1400-1550), at a time when the architectonic Costa Oriental style is found throughout the area. The mythological themes on painted murals represent death, the underworld and re-birth. In its iconographical aspect, the architecture includes niches in which the figure of a deity or lord is shown. The mythological themes on painted murals represent death, the underworld and re-birth. Venus and the Sun play key roles in defining characteristics of both art and architecture of the city. 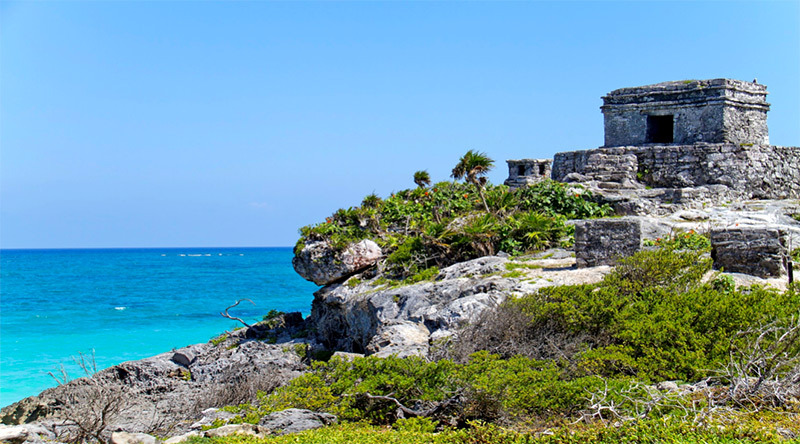 The sacred and the profane were intertwined at Tulum, because of its importance as a predominant trade center but, above all, it was a major ceremonial city. The Temple of the Frescos most prominent feature are the masks on its North and South corners believed to represent high members of the nobility or priests, not gods. On its second floor, above the doorway, is seen a niche with the Descending God figure. The palace called Casa de las Columnas (Str.25), is built on a 4ft/1.25m high platform with a large room at the back and a covered shrine. The width of the room is the largest in the region, and initially built without column or support. Its flat roof was made of round wood beams is covered with a thick mortar, and a coat of stucco on the inside. At a late date, when the roof started to cave in, a column was erected to support it. There were moldings with rosettes in the sanctuary, and a niche with the omni-present figure of the Descending God over the doorway. The Great Palace (Str.21) is referred to as the House of the Halach Uinic or “Great Lord”, with the ubiquitous Descending God plaster figure above the doorway. Its four columns portico entrance open to a walled compound. Its floor plan is “L” shaped, and suggest that the West side was added at a later date. The other three rooms had long benches, the windows were bared with an “X” shape stone and plaster signs. The adjective Halach close translation is “True Man or True Lord”. The word “true” is to be understood as “righteous” in Maya-Yucatec, a status representative of hereditary dynasty. 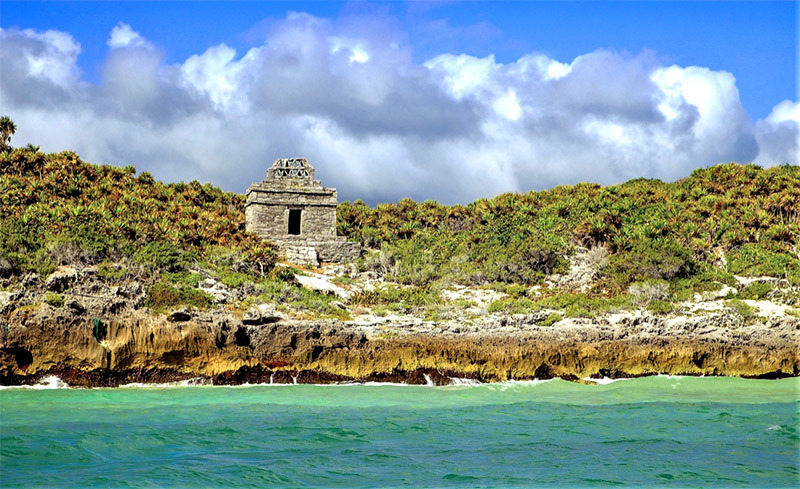 The Temple of the God of Wind – Templo del Dios del Viento (Str.45) is built on the seashore, over a karstic limestone outcrop. It is a semi-circular structure with a small altar. Its footprint and the altar point to its dedication to Ik, god of the wind and breath, since they are both the same; breath is to be understood as both the first and the last. On the second floor at the back of El Castillo, are two small openings looking out to sea, in direct line of sight with the break in the coral reef off shore, and the landing on the beach below; each held colorful markers. For daylight navigation, banners or the smoke of fires, were probably added on the roof to show wind direction. At dusk and at night, fires were lit in the two “windows” to help traders reach safe anchorage on the beach below. The fires were lit in large ceramic urns, kept close to each of the openings, to focus the light of the flames eastward, as beacons to guide travelers toward the channel, and through the barrier reef for safe landing. The Wall of the city was made of stones on its North, South and West sides. There were 5 low and narrow 4ft/1.3m high tunnel like entrances – to slow down raiders. The wall average height was 17ft/5m and 20ft/6m wide at the base. On the seashore side, beside the rocky cliff, were added palisades of tree trunks on the North and South side for defense. 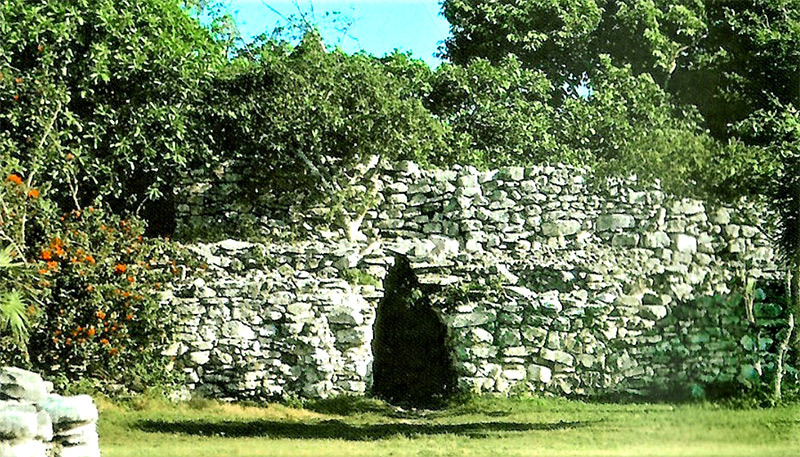 Half a kilometer North of the city’s wall, are two Temples, one a ruin, the other the Temple of Nauyaca (Str.59). The one room structure holds a small altar at the back. Its unique crest on the roof underline the fact that it was built earlier than the oldest structure in the city, possibly Early Classic (1250 or before). Remains of ceramic point to the veneration of Ek Chua and other deities, protectors of sea traders and travelers, and was both a shrine and a coastal marker. It is now time to relax and enjoy the beauty of the Caribbean coast, its great beaches, blue waters and the warm Mexican hospitality. 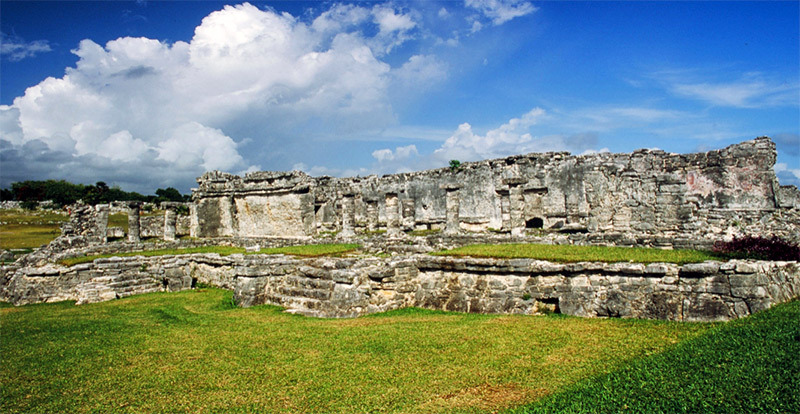 For more information on Tulum archaeology, please visit the “Lectures” page of www.mayaworldimages.com. 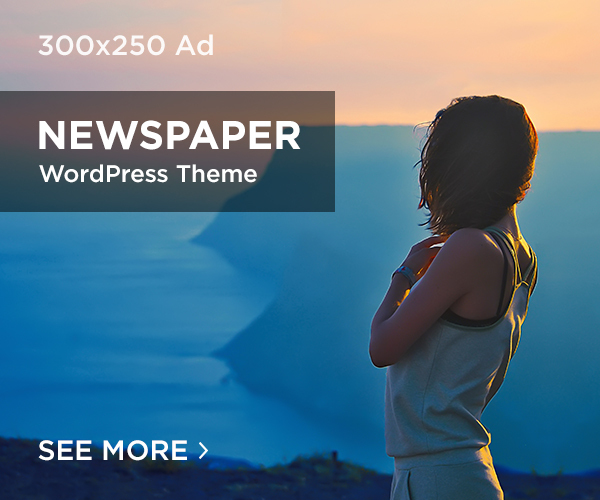 © Copyright 2019 - George Fery, all rights reserved.